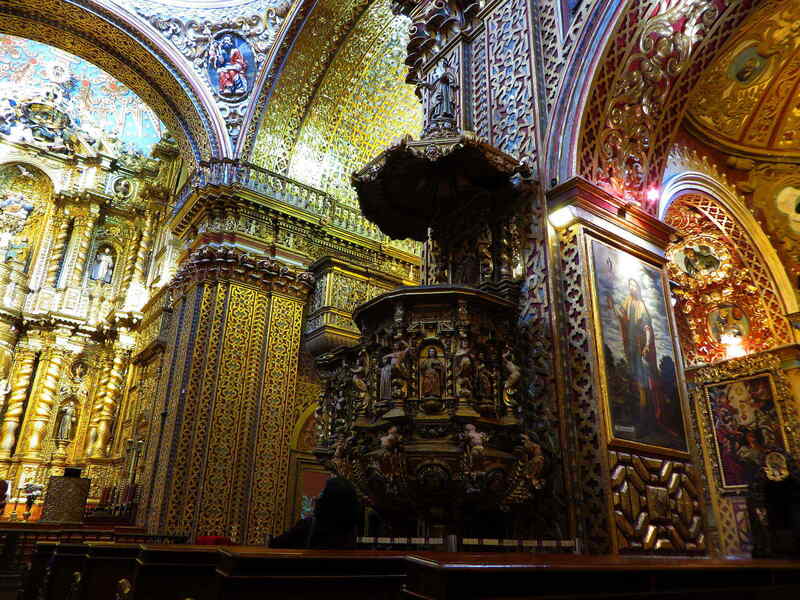 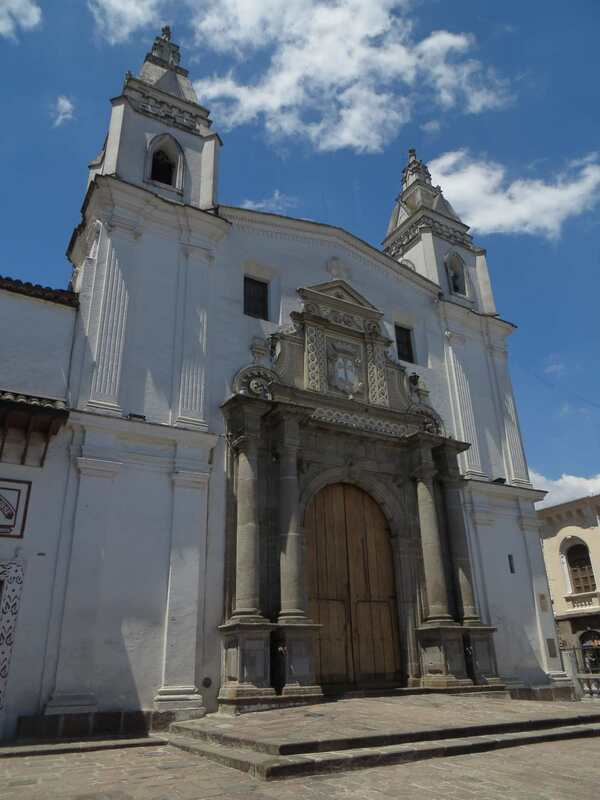 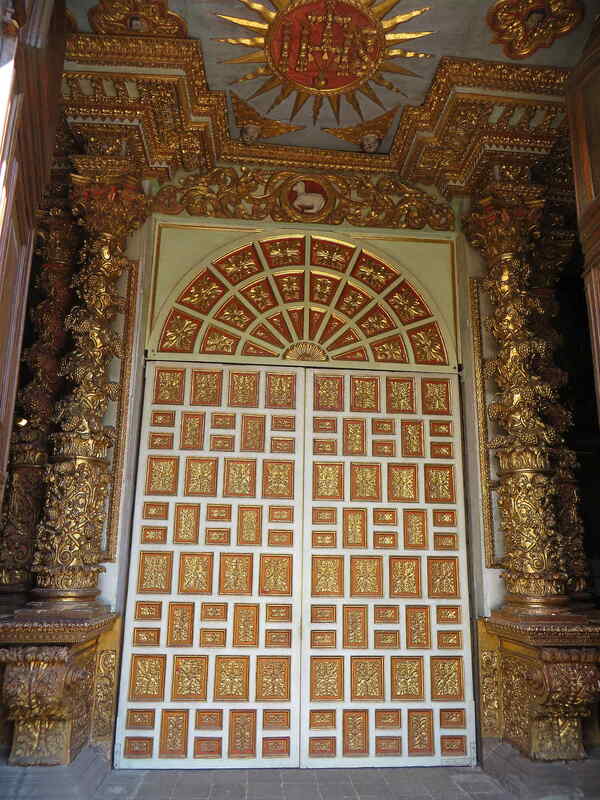 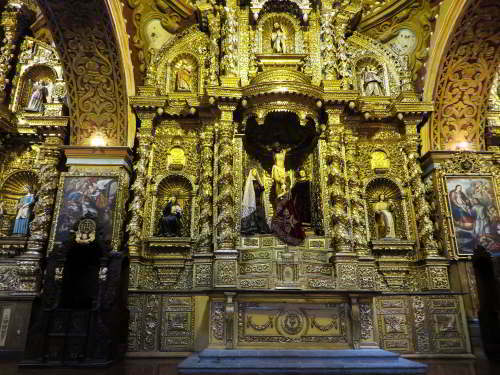 ALL 25 FAMOUS CHURCHES IN QUITO, Pictures, addresses and descriptions of all historic churches of old town Quito. 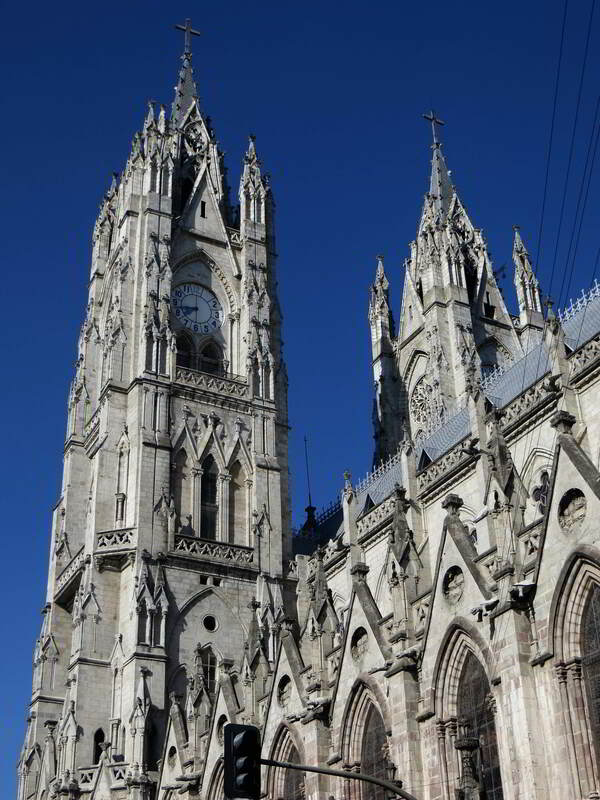 The National Cathedral borders the entire length of the South side of the Plaza de la Republica. 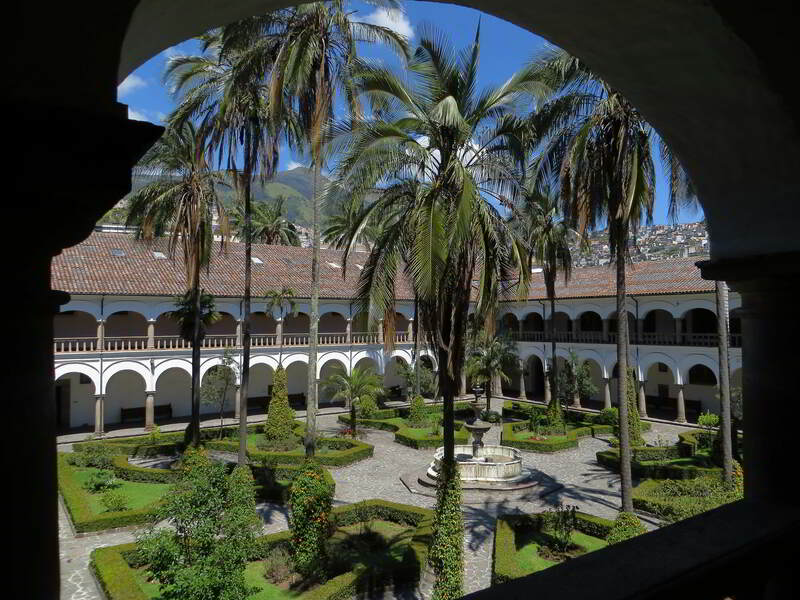 The names of the original 204 Spanish conquerors are listed on its wall. Inside is the mausoleum of Antonio Jose de Sucre the founder of Ecuador and some of the country's most important historical figures are buried here. Adjacent is the Sagrario Church, built on top of a ravine that cut the city in two; it boasts magnificent altars and baroque elements. 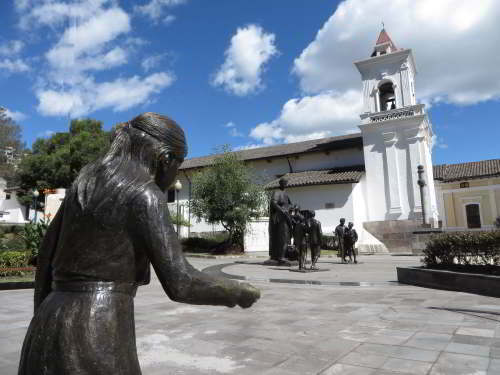 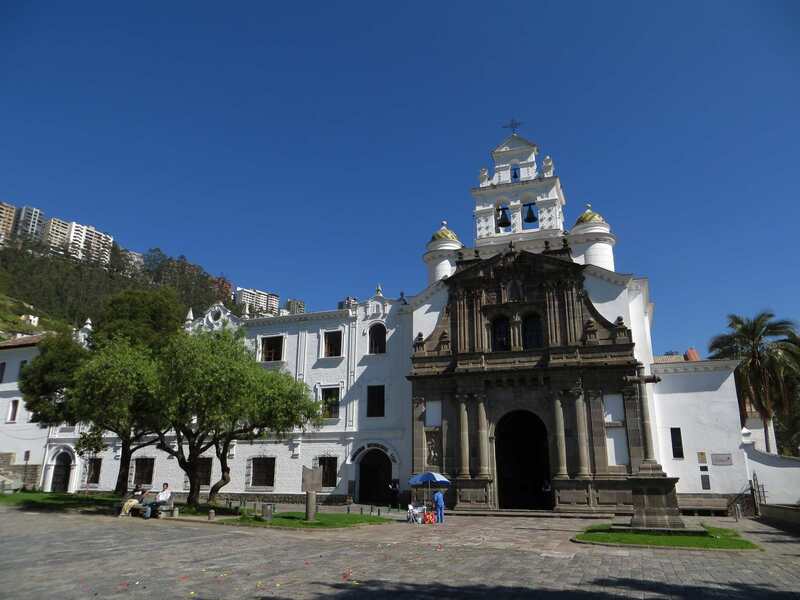 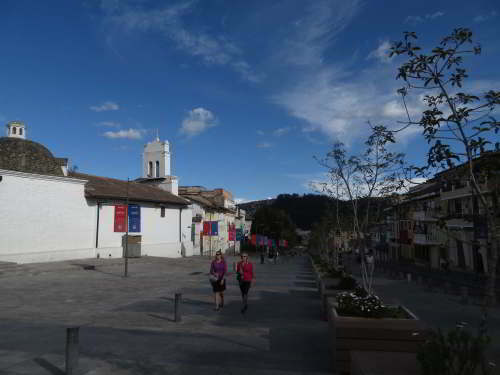 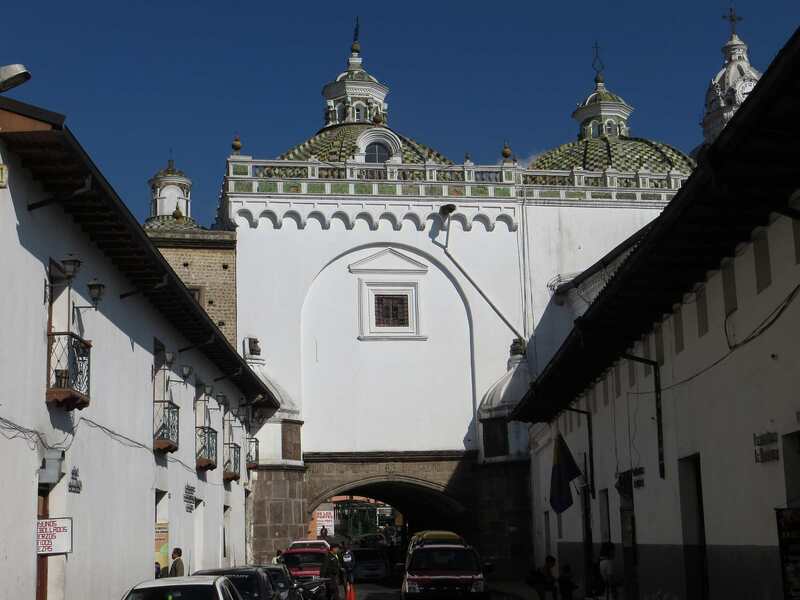 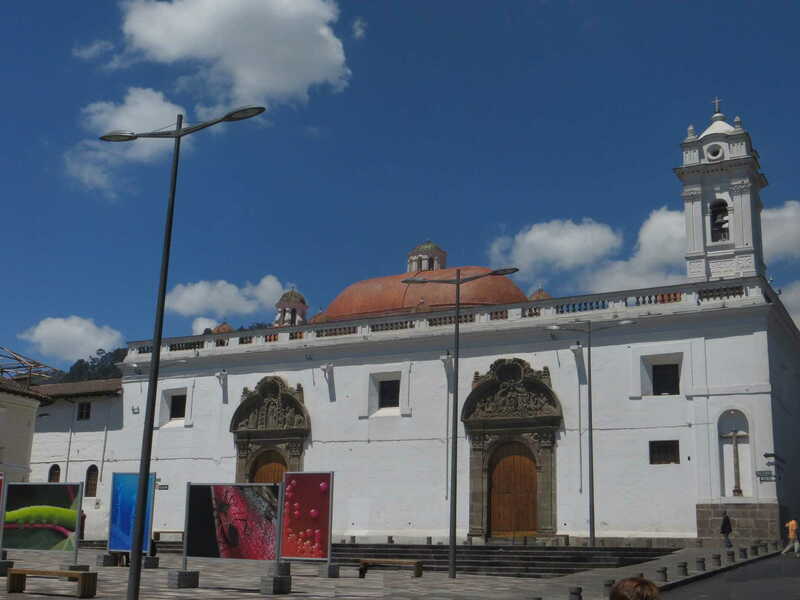 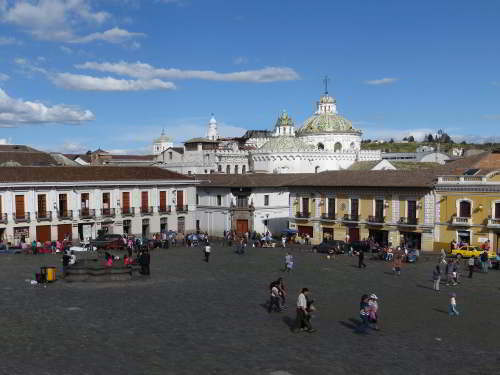 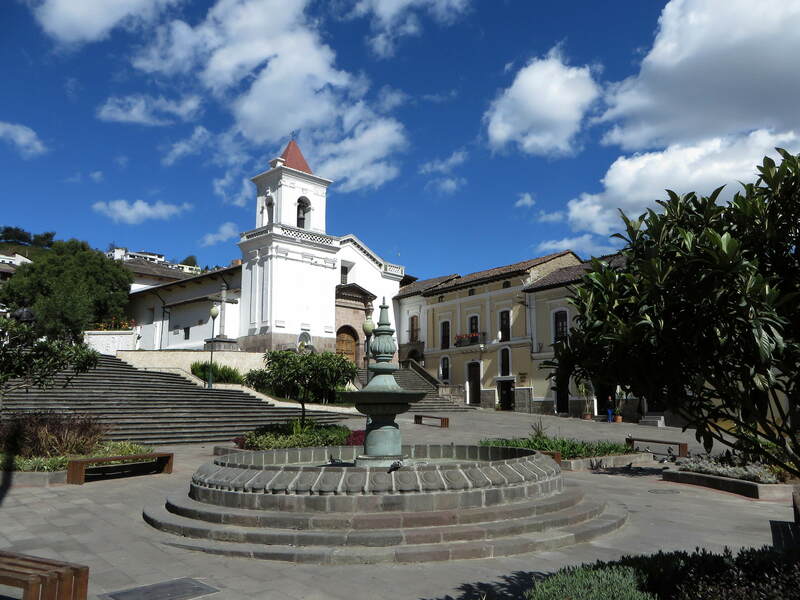 Across the plaza, the Conception Church and Convent was Quito's first feminine monastery and is one of five cloistered convents in the historical center. 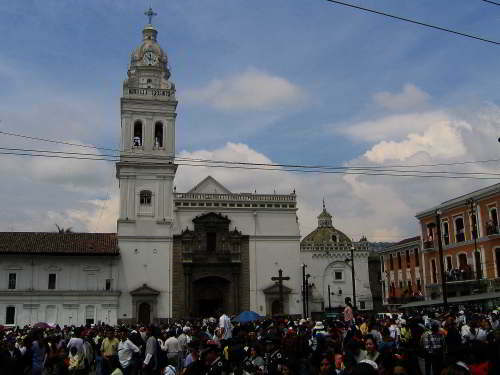 The San Francisco Plaza is dominated by the San Francisco Church and Convent which is the home Franciscan Order. Part of the Convent is open to the Public and used as a museum. 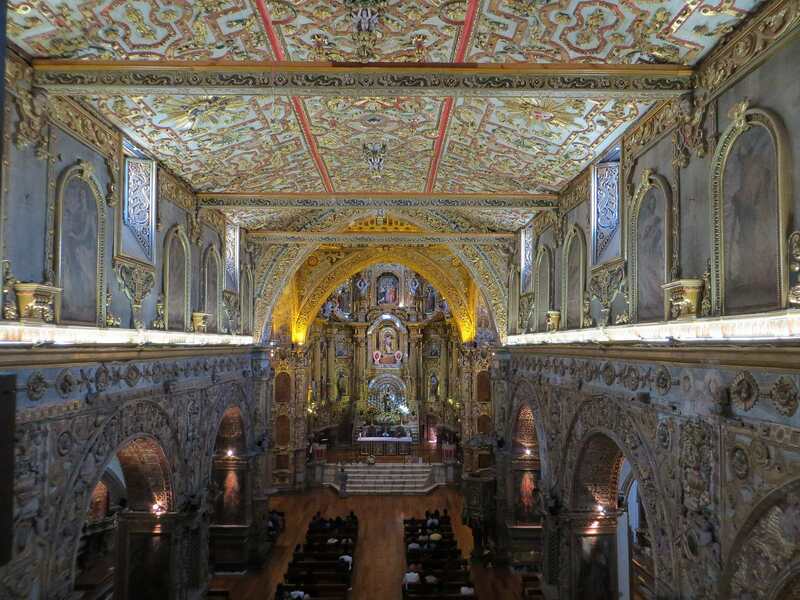 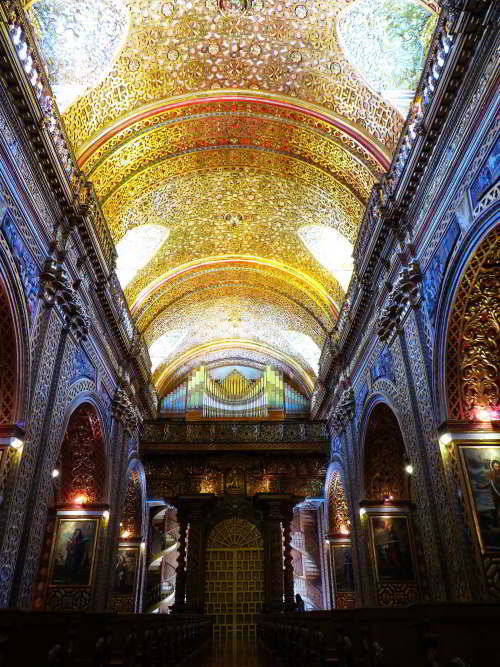 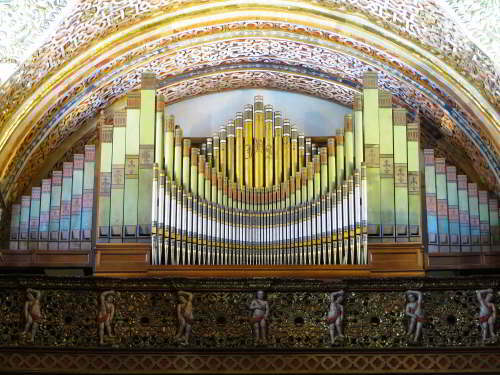 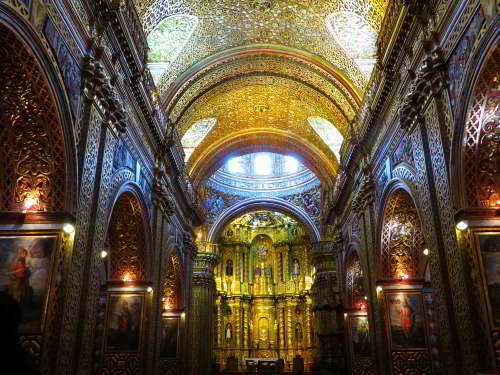 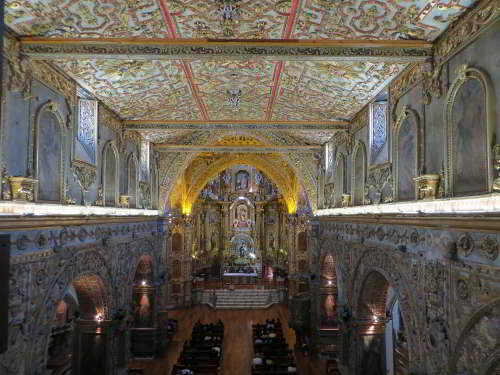 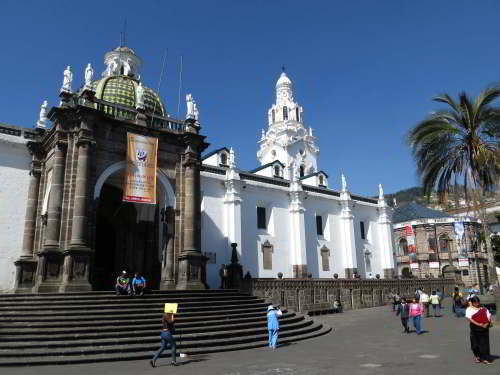 The Compa�ia de Jesus Church is is not only the most lavish historical church of Quito, but of all the Americas. Painted in gold leaf its exuberant interior leaves an unforgettable impression; next door is the Metropolitan Cultural Center, which houses rich rotating expositions. 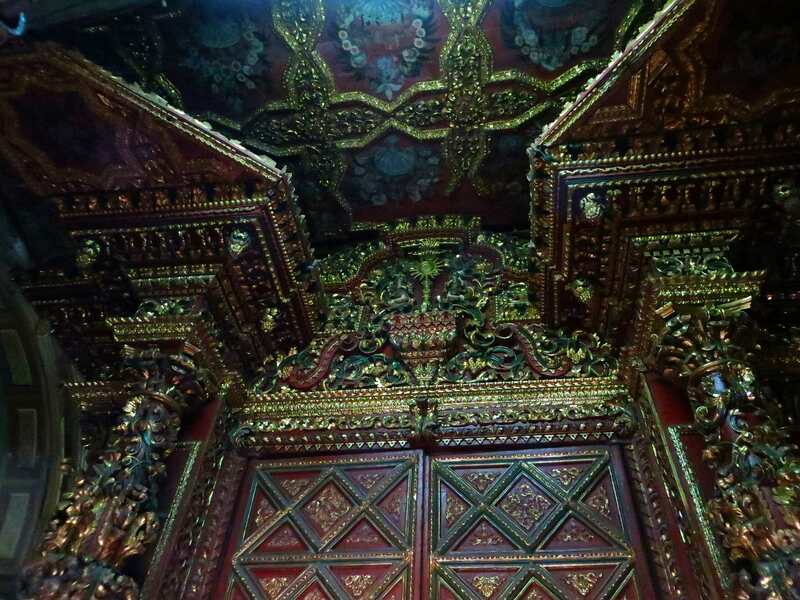 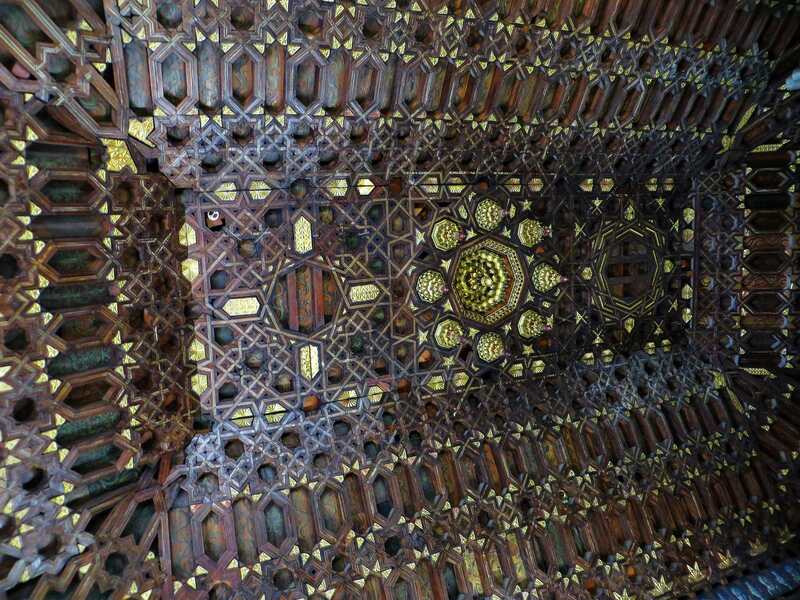 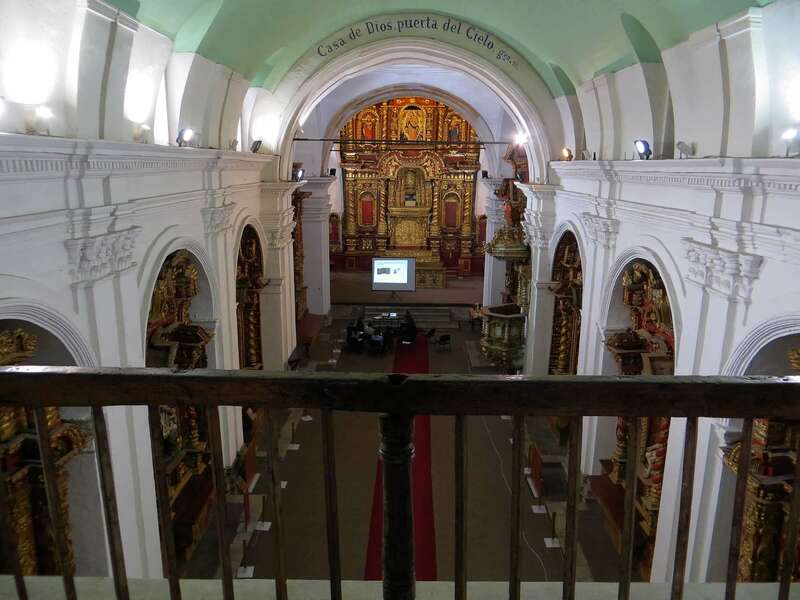 The roof of the Mud�jar style church features paintings of martyrs of the Order of Saint Dominic. The roof of the nave is composed of a pair and knuckle frame, coated inside by pieces of tracery. 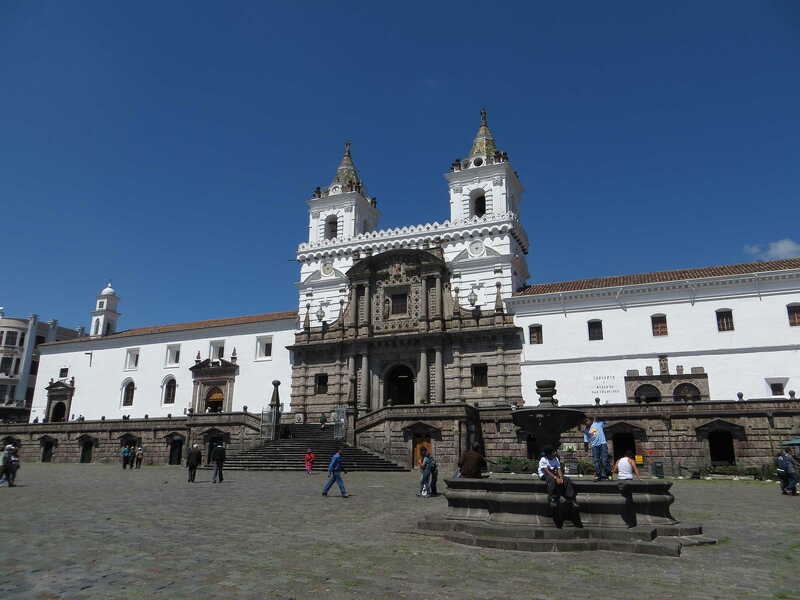 There is museum on the north side of the lower cloister with pieces of Quito sculptors. 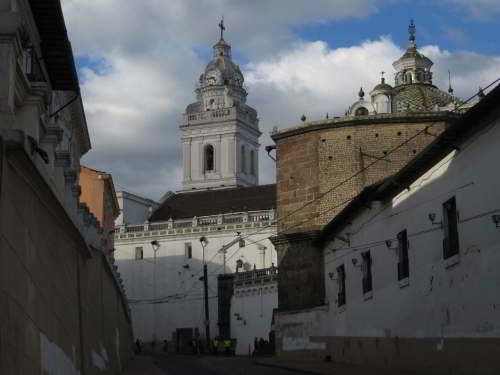 To the right of the church is the Rosario Chapel, built over the famous Arco Del La Capilla Del Rosario. 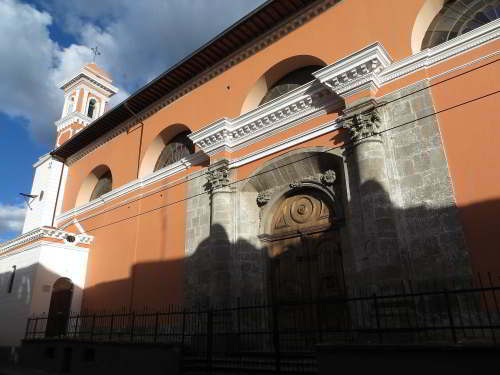 The original La Merced Church is one block west of the Plaza Central. 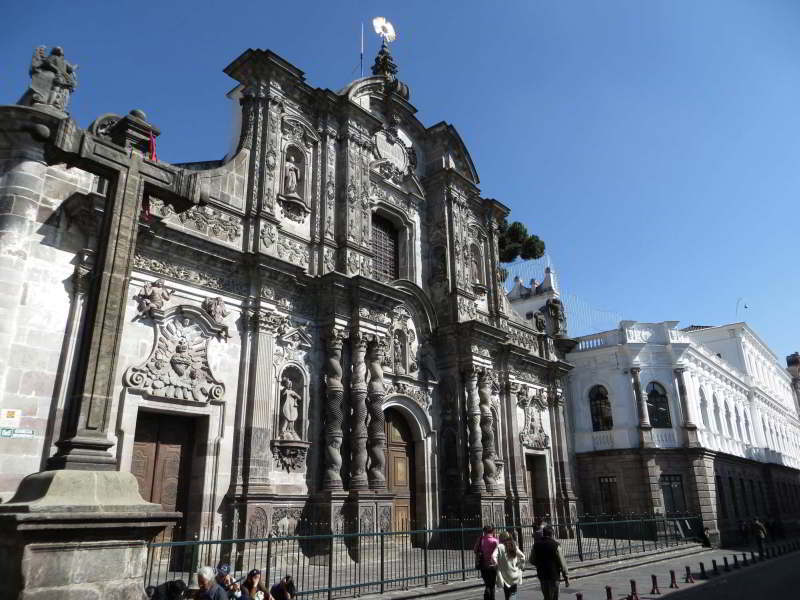 It was destroyed in an earthquake in 1660 and the construction of a new church started in 1701. 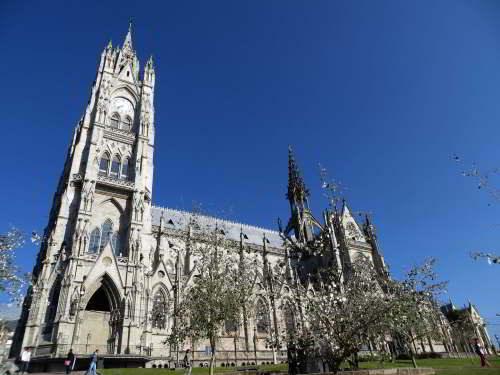 The tower was completed in 1736, and the church was dedicated in 1747. 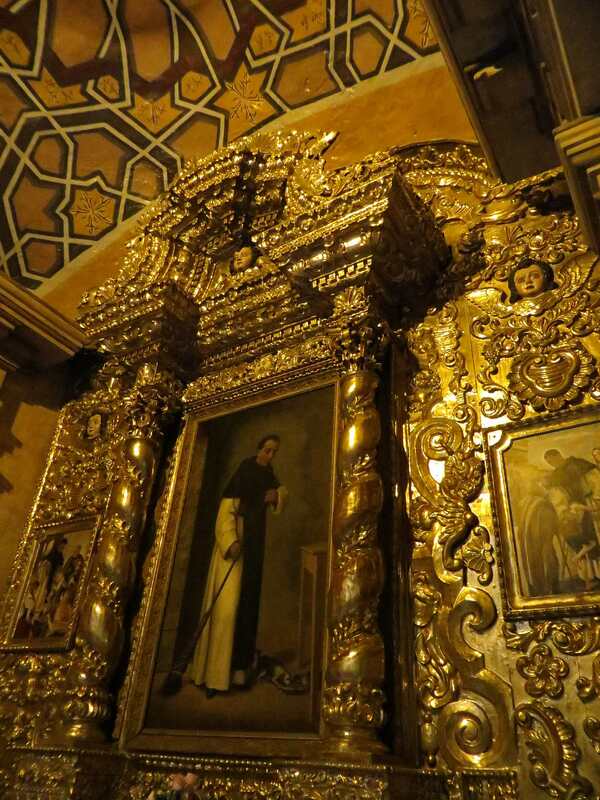 Bernardo de Legarda was commissioned to do the main altar�piece, in 1751. 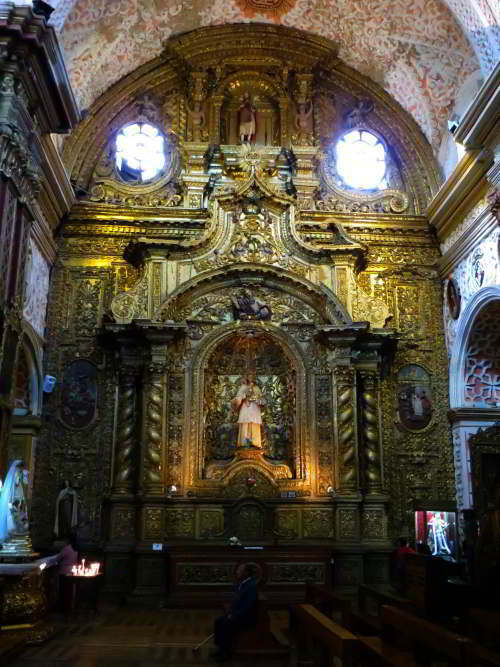 The La Compa��a de Jesus Church was built between 1605 and 1765 and is one of the most beautiful Baroque style churches in the Americas. 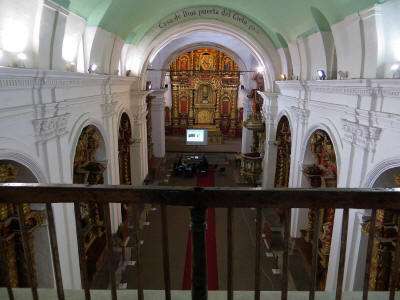 It is administered by the Fundacion de la Iglesia de la Compania. 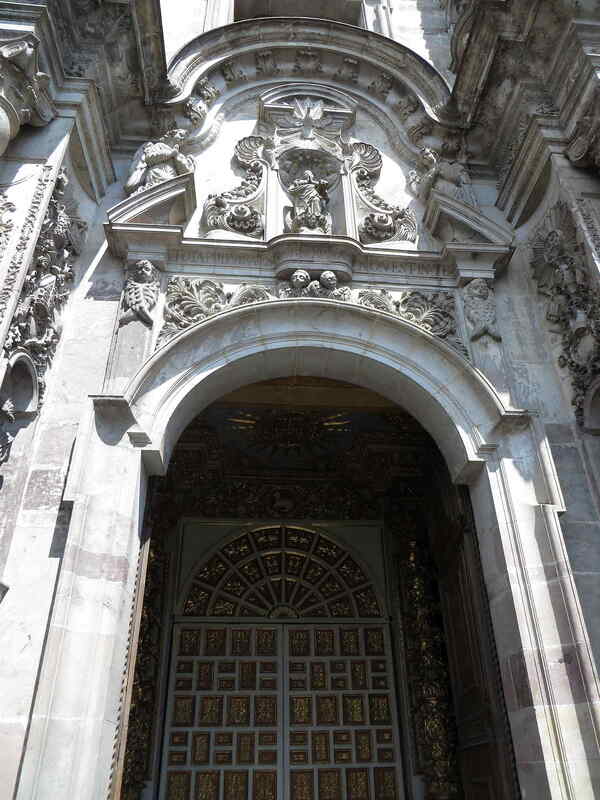 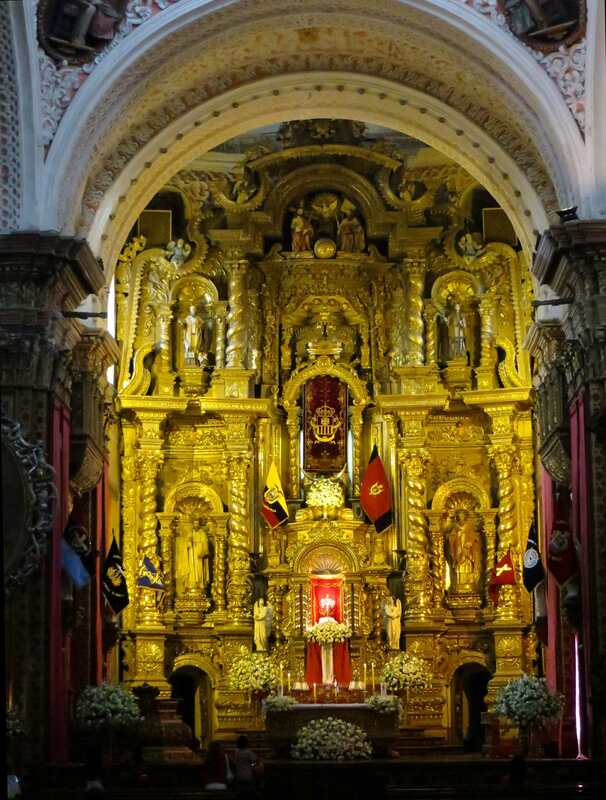 The Compa�ia de Jesus churches in Soouth America are Jesuit churches and can also be found in Lima and Arequipa. 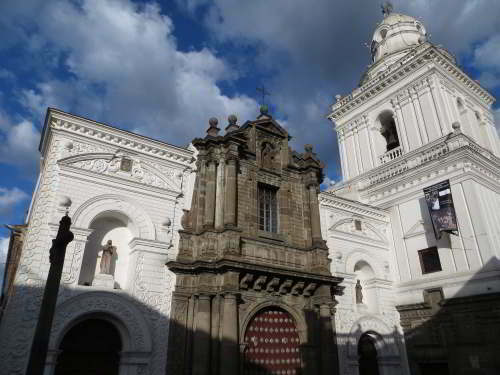 The Cathedral of Quito, Catedral Metropolitana or National Cathedral on the south side of the Plaza de La Independencia, is one of the largest colonial churches of Ecuador. 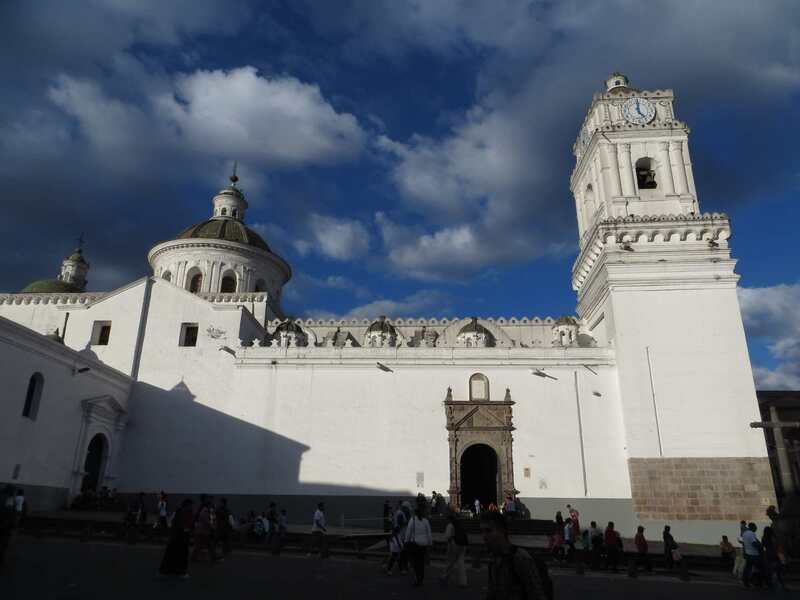 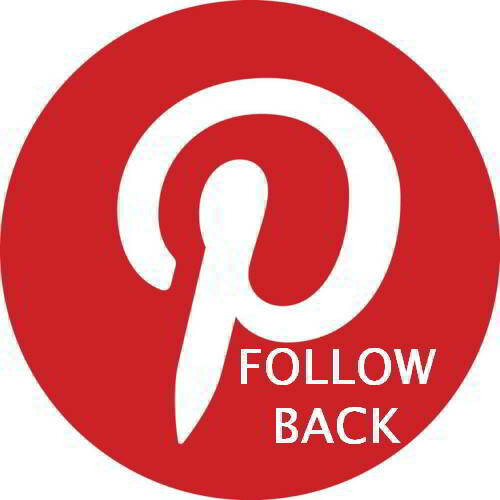 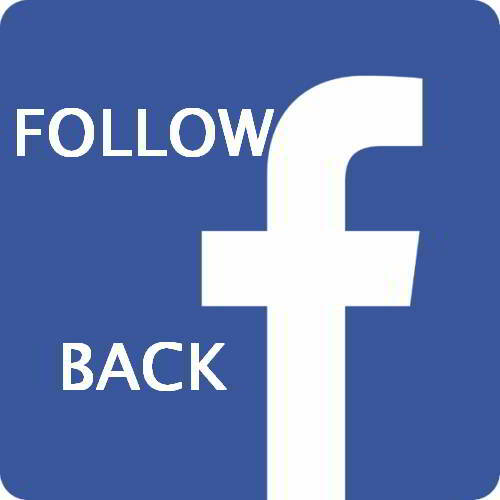 Its construction began in 1562, 17 years after the creation of the diocese of Quito(1545), and it was completed in 1806, during the administration of President of the Real Audiencia, Baron H�ctor de Carondelet. Right bottom: Santa Catalina Church. For detailed information on climate and weather conditions read: climate of Cuenca, Ecuador; climate Galapagos Islands in Ecuador; climate in the Amazon of Ecuador and climate of Ecuador. 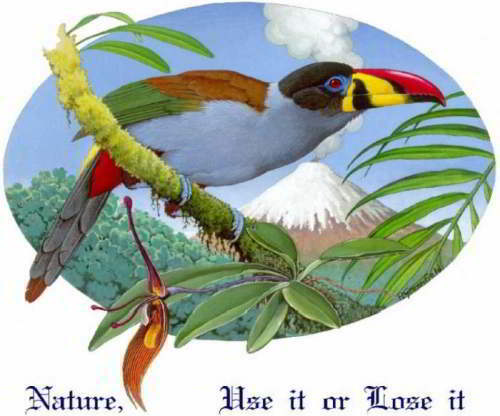 If you want to learn more about the country, read Ecuador Facts and Culture.